Bandai’s first Star Wars Episode 1 figure for 2016 is none other than the illustrious Obi-Wan Kenobi. While I love getting troopers, robots, and helmets, the main characters are exciting additions and where it’s at. Especially when those characters get the “Figuarts treatment.” Now I’d be lying if I said this was my favorite incarnation of Obi-Wan. The Padawan version is cool, though. And he serves the purpose of having an opponent for Darth Maul, especially if they have no immediate Qui-Gon Jinn intentions. However, bearded Episode 3 Obi-Wan is the best, and luckily I believe Bandai already has one coming our way later this year. I’d like to say that everything has been kittens and rainbows with Obi-Wan, but that is not the case this time. This is actually the first time I’ve purchased a defective S.H. Figuarts toy. Okay, well the whole figure isn’t defective, but one of the heads is. He comes with two heads: one with a neutral look and the other a slightly more concerned and open mouth expression. The latter head that I received did not have the socket that plugs into the neck ball-joint, so at first I thought I was boned. In response to this defect I inquired if the store I ordered from could replace that part. This was when I found out how things work in Japan; stores over there do not keep a lot of overstock most likely due to space concerns. They didn’t have a replacement. However, they did offer to either have me send it back or give me a decent discount on a future order. These Star Wars Figuarts tend to shoot up in price after release, so I’d rather have the figure with a slight defect than none at all. I opted for the discount. Then immediately turned around and bought some Metal Gear Solid figures. I’m an adult buying adult things! We got slightly off track here but I do want to mention that Hobby Link Japan treated me very professional with this whole situation. I appreciate that and highly recommend them. Obi-Wan comes with a great selection of accessories: an alternate head, three additional pairs of hands, a lightsaber hilt that can plug into his belt, his lightsaber, and Qui-Gon’s lightsaber. The Ewan McGregor likenesses on both heads are crisp and well done. The printing process they use works really well and it is a giant step up from Hasbro’s Black Series work. It still isn’t perfect. But strangely enough the facial detail doesn’t always photograph well. His neutral face can look a little derpy from some angles. The only complaint I have with the heads is that Bandai really overdid it with the gold paint on his hair. It looks as though he dipped his scalp in liquid gold. Sure, frosted tips were the thing in the nineties so I appreciate the throwback reference, but damn! The hand selection is really nice, especially the “peace sign” hand that I am having far too much fun with. I had a little difficulty at first with the lightsaber holding hands because they are designed to peg into the wrist at an angle. I understand why they did it this way. It enables him to hold the lightsaber outward and also allow the handle to clear his Jedi sleeves. However, it’s a tough angle to plug those tiny hands into that small peg. The utility of this design decision certainly outweighs the inconvenience, though. With this figure I was looking forward to seeing how the Jedi-garb body turned out since we will be likely getting a few characters that use a similar base like Mace Windu. As can be expected, the attention to detail such as the textures of the cloth or the tiny painted parts on the belt are all there. The arms are very free to move around in just about any pose. However, some more extreme poses may look a bit silly since the sleeves are sculpted to sit on the arms and droop downward. Unfortunately there is no way to avoid this with the costume’s sleeve design. The nice thing about the Figuarts release schedule is that I get one or two figures a month for my collection, just like with my Mattcollector subscriptions. These figures are amazing to play around with and pose (unlike my Mattycollector subscriptions) so the pace of release gives me plenty of time to appreciate each character. Obi-Wan poses great and is a blast to mess around with. Priced at or around twice the cost of a Hasbro Star Wars Black figure you are getting a solid toy from objectively one of the best Star Wars movies ever made. Despite his golden hair and my defective second head I can’t praise this Obi-Wan enough. The Figuarts Star Wars line just continues to improve with each and every release. 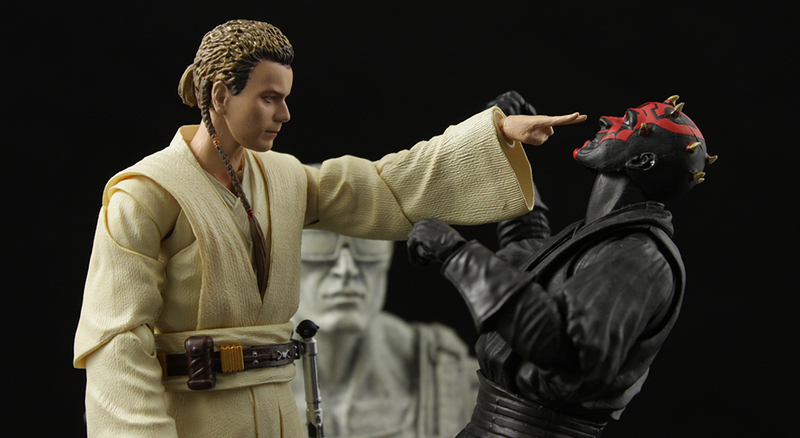 As I mentioned earlier, most of my go to import places for Star Wars Figuarts are long sold out. It may be worth keeping an eye on Amazon though, the prices tend to come down as time goes along.